Sunlight coming from behind lights up this beautiful Monarch Butterfly and the white petals of the hydrangeas. These hydrangeas in my garden attract many types of bees and wasps along with butterflies. There are a couple of honey bees in the painting too! 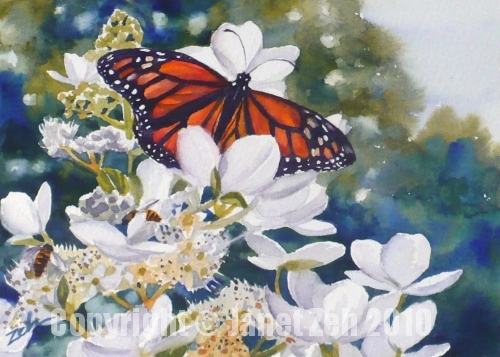 The original has been sold, but you can find the fine art print of Monarch Butterfly and Hydrangeas in my Etsy shop. Thanks for stopping by today.